The game will now take place on Thursday night. 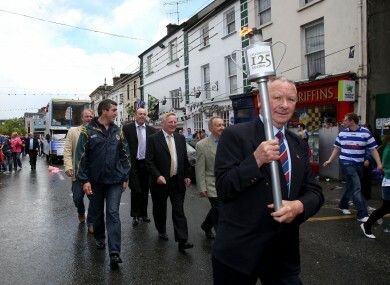 Jimmy Doyle at the torch parade to Semple Stadium for the GAA's 125th anniversary celebrations in 2009. TOMORROW NIGHT’S MUNSTER minor hurling semi-final between Tipperary and Clare has been postponed as a mark of respect to the late Jimmy Doyle. The Tipperary hurling legend passed away yesterday and tomorrow’s scheduled clash at Semple Stadium has now been deferred. It will now take place 24 hours later on Thursday night at the same venue with a throw-in time of 7.30pm. The Munster Council confirmed the news this morning in an official statement, revealing that Tipperary had made the request for deferral with Clare immediately agreeing to it. Doyle was regarded as one of the greatest hurling of all time, being named on the Hurling Team of the Century in 1984 and on the Hurling Team of the Millennium in 1999. Munster Council chairman Robert Frost paid tribute to Doyle. “Jimmy Doyle was one of hurling’s greatest ever players. He won 9 Munster senior hurling medals with Tipperary and 8 Railway Cup medals with Munster among many other accolades including 6 All Ireland senior hurling medals. The funeral arrangements have also been confirmed this morning for Jimmy Doyle. Reposing at Sarsfields Social Centre, Semple Stadium on Wednesday June 24th from 4m to 8pm arriving at the Church of St. Joseph and St. Brigid, Bothar-na–Naomh at 8.30pm. Requiem Mass on Thursday at 10am. Funeral afterwards to the Island Crematorium, Cork. Email “Tipperary-Clare minor hurling clash postponed as mark of respect to the late Jimmy Doyle”. Feedback on “Tipperary-Clare minor hurling clash postponed as mark of respect to the late Jimmy Doyle”.